I was 10 when the TV show Reading Rainbow debuted so I don't think I watched it much.... but I have some memories of it, maybe from babysitting? Lately I've been doing a different kind of Reading Rainbow.... devouring author Rainbow Rowell's books. Full disclosure- I am addicted to the Audible app! I first began listening to audiobooks when I was training for a half marathon a few years ago, and even though I've given up long-distance running, I've always got a book downloaded and you'll often see me with ear buds in. Earlier this year, Audible suggested I give Rainbow Rowell's Eleanor & Park a try, most likely due to my predilection for YA fiction (in particular, all things John Green). From Amazon.com: Set over the course of one school year in 1986, this is the story of two star-crossed misfits--smart enough to know that first love almost never lasts, but brave and desperate enough to try. 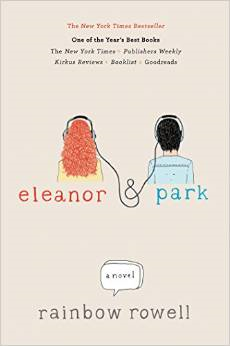 When Eleanor meets Park, you'll remember your own first love--and just how hard it pulled you under. You. Guys. So so so so good. So good that anything I write about it won't do it justice. It'll just be embarrassingly *not* enough. Let's toss it to the writers of Forever Young Adult for a proper review. After E&P, I immediately downloaded Fangirl, which I have listened to no less than 4 times in the past 2 months. It's just that good. (And has my current bookcrush in it.) Again, Forever Young Adult says it better than I ever could. So, spoiler alert: I am so Cath. No, I don't write fanfic, but I can so relate to introvert Cath and her anxieties. And Levi, oh Levi. I am officially smitten. 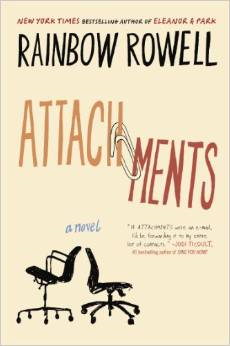 Next, and by that I mean later that same day, I moved on to one of Rowell's adult fiction offerings, Attachments. From Amazon.com: In sweet, silly, and incredibly long digital missives, best newsroom pals Beth and Jennifer trade gossip over their romances—Beth with her marriage-phobic boyfriend, Chris, and Jennifer with her baby-mania-stricken husband, Mitch. What they don't know is that the newly hired computer guy, Lincoln, an Internet security officer charged with weeding out all things unnecessary or pornographic, is reading their messages. But lonely Lincoln lets the gals slide on their inappropriate office mail and gets hooked on their soapy dalliances, falling head over heels for the unlucky-in-love Beth. I promise you'll find yourself rooting for Lincoln! 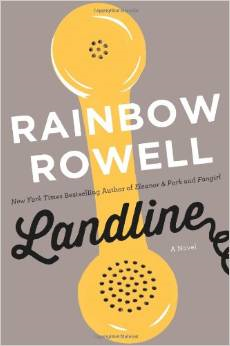 I just finished Rowell's latest book, Landline, which for some reason I was hesitant to start. Actually, I know why.... although her other three books had storylines that could actually happen, Landline has a time-traveling phone plotline. Just suspend your disbelief on that one and go for it, I promise it's an amazing book. Part of the reason I think I loved all these so much was the narration on Audible. 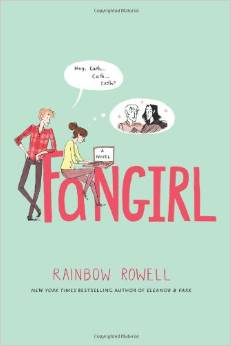 Rebecca Lowman narrates Fangirl, E&P and Landline and she has an amazing voice. I've always called myself a speed-reader but I think I am actually more of a skimmer, and I suspect I may actually have some sort of a visual processing disorder like my kiddos (and this might make even more sense to you after reading about my bookcrush in Fangirl). I've found I get so much more out of a book listening to it rather than reading it.